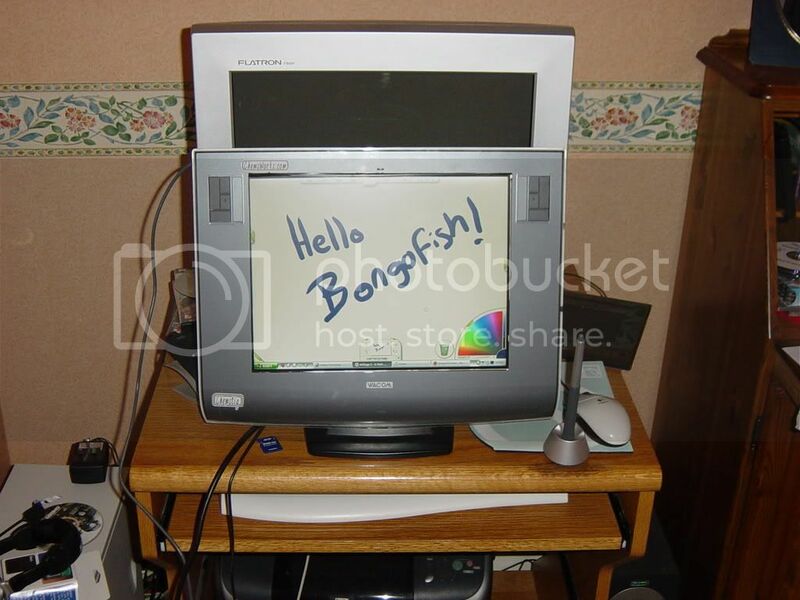 Bongofish > Screen Tablet malarky > The Trading post > Selling custom builds? Yeah it does all the main things. The only two downsides to my build is that a pixel died yesterday. And that due to the senstivity of the pointer you cant click on the start bar, Ive managed to do it once but its not designed for browsing. But other than that its perfect. I will be sure to drop you a line if/when I want to sell it. The revolution has turned into a money hungry run for power i thought we had some kinda communist thingy going with drew as the mighty BongoKing but now it seems the capitalists have taken over..
ps. if google decide to pay 2 billion for bongofish, I want my fair share ! oh and im willing to make an exact replica and i mean EXACT for the cheap price of £1500 (thats for the 15") by make i mean purchase and by replica i mean original. but you can have my build with blue electrical tape and all for £319.. thats a whole quid cheaper then chems.. $2 US.. think about all the money your saving. there are non.. its coffee and tea resistant. ! fire proof as long as kept away from flames of any kind, and can breath under water. as long as you purchase the lung expansion pack, which costs a further £1000 but its worth it if you ever want to draw underwater. I mean both do the same thing, mine has a technological advantage with more pressure and resolution I think, it also has fancy touch strips. So at the end of the day if your going to spend $2 more which are you going to go for! PS Love the last post Dynamic, I lol'ed! i hear those lung expansion packs are almost impossible to find; out of stock everywhere. they go for almost double on ebay. Ohhhhh - I wanna build my VersaSketch and sell them. I've even got a couple of linux guru's from work working on a leaned out distro of linux (the Graphux distro) and have found a couple of open source illustration/animation tools I'm gonna pay to have customized to run on the light weight box. I think I can put the 15" inch together with an older 9x12 for a cost of about $500, including batteries, VGA pass through, and the Graphux box for art-on-the-go. What do you think I could sell them for? Speaking of the software, what's most important to you in a drawing/painting application? In a 2D animation package?